FOR DAILY TRIPS: 49 GUESTS CAPACITY FOR WEEKLY TRIPS: 10 GUESTS CAPACITY Welcome to our beautiful yacht Canados! We are happy to offer the amazing ! 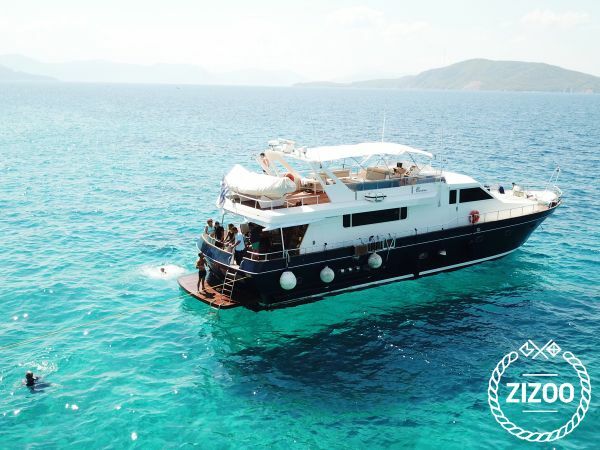 An amazing Canados motorboat sailboat that will take you to breathtaking places, all along the out of this world Saronic gulf and its main attractions the Islands of Hydra,Moni, Poros, and Aegina. The adventure starts from 8AM from Athens Marina Zeas and will end at 7PM. Get ready to enjoy the beauty of the greek islands, with their famous tiny white houses, their mesmerizing blue waters, the endless sandy beaches and, of course, the unforgettable traditional greek dishes! Our first stop will be the breathtaking island of Hydra, famous for its green landscapes and its white and elegant mansions which add to the perfect scenery. Our second stop will be in the island of Poros, where you are about to live the ultimate culinary experience! Continuing, we will take you for a dive in the small but beautiful island of Moni, and then, Aegina, the island with the endless beauty and history! Extras: Fuel, Food & Drinks, Chef/ Hostess 150 Euro per day plus provisions, Final Cleaning: 100 Euro APA 30% off the charter pric What are you waiting for? Send us a message!